This custom galvanized boat trailer axle is manufactured to the customer's track and spring center measurements. Hot dip galvanized trailer axles provide maximum corrosion resistance in saltwater applications and can last years. All boat trailer axles require 4-6 business days for fabrication. There must be a minimum difference of 14" between the track and the spring center measurements in order for this axle to be built. In order for an axle order to be placed Champion Trailers will need to know the track and spring center measurement. Make sure to take a look below to see how to measure and how to pick out your new trailer axle. 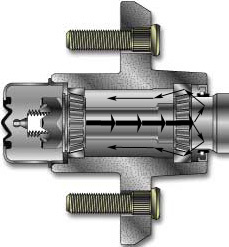 Interested in how the spindle lube spindle works? Look below to see how the spindle lube trailer spindle greases your trailer bearings without ever having to take your trailer hub of the axle. Select your axle part number from the axle charts. Be sure to identify axle over or axle under springs when you select your part number. You want an axle that is similar to the one currently under the trailer to avoid any problems with clearance. We need your axle track measurement. This measurement is taken from the face of one hub to the face of the other hub. DO NOT measure from the back of the hub or brake flange as this will provide an incorrect track measurement. MEASURE HUB FACE TO HUB FACE ONLY. The only other measurement needed is the spring center. This measurement is from the center of one spring to the center of the opposite spring. This is a very important measurement as this is where your springs will sit on the axle. (Quick Tip) An easy way to measure your spring center is to hook a tape on the outside of one spring and measure to the inside of the opposite spring. This will give you an accurate measurement. How does the Spindle Lube Spindle Work? This trailer axle features the Spindle-lube ® hub lubrication system which allows you to grease the trailer hubs without removing them from the axle. Unlike a bearing 'buddy', which only pumps grease into the front of the trailer hub and can often be over-pumped and blow the grease seal, Spindle-lube trailer axles pump the grease to the back of the trailer hub by a hole bored through the length of the trialer spindle where it enters the hub just before the rear seal. The grease then moves forward filling the trailer hub and trailer bearings completely. When re-packing hubs with these trailer axles, the old grease will come out of the front of the hubs, around the tip of the grease gun. The grease should continue to be pumped until new grease comes out of the front of the hub. Then just replace the rubber plug into the dust cap and you are ready to go! !